FROM I45 TAKE THE STATE HWY 105 WEST EXIT. TURN WEST ON STATE HWY 105. AT THE SECOND TRAFFIC LIGHT TURN LEFT ON SGT ED HOLCOMB BLVD N. THE OFFICE IS ON THE LEFT. The Conroe Social Security office is located in Conroe 77304. The following page includes information for this location like the office phone number, hours of operation and driving directions. If you have any interests or comments about your retirement benefits or are interested in making an appointment, call the following Conroe Social Security office. The Conroe Social Security office is located in Conroe 77304. The following page provides information for this location like the office phone number, hours of operation and driving directions. 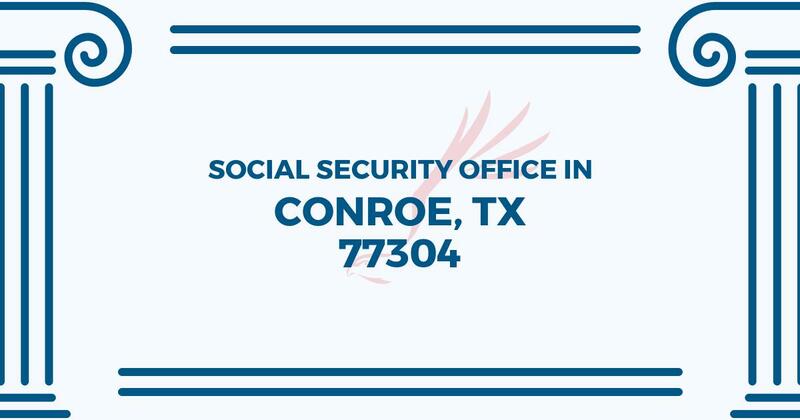 If you have any curiosities or issues about your retirement benefits or are interested in arranging an appointment, call the following Conroe Social Security office. Over the past 5 years my wife and I have visited this office at least ten times. Every single time, without exaggeration, the staff have been helpful, friendly and very knowledgeable. I do not know what issues, others have had with them, but our experience has always been 100% positive! Of course, we have always been respectful of them and thankful for their help. That always goes a long way towards having a positive experience in any relational setting. We have noticed that the security guard is strict, but understood that he is probably used to some visitors who are not respectful of the office rules and of those visiting. He’s got a tough job. Be thankful you have an office you can go to for some help, be friendly and respectful. You will have a better experience for it. I procrastinated for 6 months to get my name changed after getting married because I was dreading coming; all the reviews made it sound horrible, well luckily that wasn’t the case for me. I showed up 4 min before opening I had all of my paperwork ready (ID, marriage certificate and the application for the name change filled) they separated everyone based on what they needed done and they let us in, I immediately got a ticket and a window and at 9am (opening time) I was sitting in front of the window waiting to get helped. I was LITERALLY out by 9:07am!!! The guy helping me was amazing! He was super nice and got everything taken care of soo quickly!! Who ever was on window 9 this morning THANK YOU! If you come, please come PREPARED! It saves everyone soo much time!